Beautiful shots of the birds. I especially like the colours I the first photo you shows us. Thank you very much Coline. Amazing scenes. I like your perspectives of Spring. 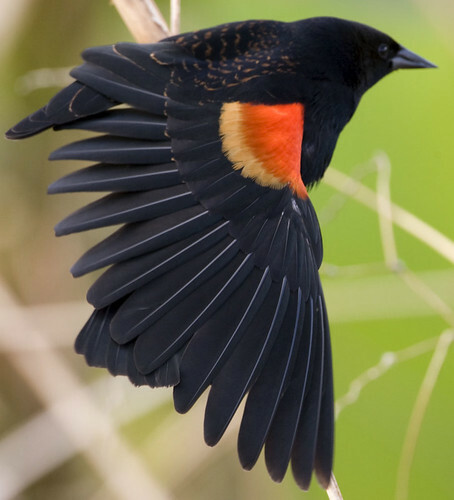 The first time I hear the red winged blackbird’s liquid call is when I know Spring has really arrived. Great shots, as always. EXACTLY! The call of the RWB and the loon are the two sounds that let me know I really can put the snow shovel away. As always, thank you for the great compliment Sreejith. The call of the RW blackbird has long enchanted me, so thanks for the memory! Absolutely love your green abstract, Jeff. Thanks Gary. I love that sound, and I love that plant. I more look forward to it than just about any of the wildflowers I photograph. Red Wing Blackbirds are my favorites, we live by a marsh and I look forward to hearing them every year – as always great shots! Thanks Carrie. They’re a favorite of mine as well. They may not be the flashiest bird around, but I look forward to their return every year. Such charming and beautiful spring photos Jeff! I didn’t know you are a poet, too, Jeff 🙂 Lovely words to go with your images of spring. Never in a million years would I have ever thought I’d actually enjoy writing. Wonderful choices Jeff. have seen many red-winged blackbirds but have never seen 2 together. Great catch! One of my favorite birds. Up close, that color part is a bit strange. Mine too. Strange how? Or are you referring to how it looks in my photo? No…I’m referring to actually up close on the bird. Whereas on birds you can see the frail bone lines through the wings, but in that color spot (area) on that bird…it as if there are no bones underneath…does that make sense? Usually you can see the lines all the way through the wings, but in that color area…it looks like soft velvet. Gotcha! I’ve never really had a chance, or a long enough lens to get a good look up close. The photo you shared, that makes mine look pretty lame by comparison thank-you-very-much, really shows it though. Lovely glimpses of the Spring! Like especially the first and the last image. Loving the last image. Great composition!